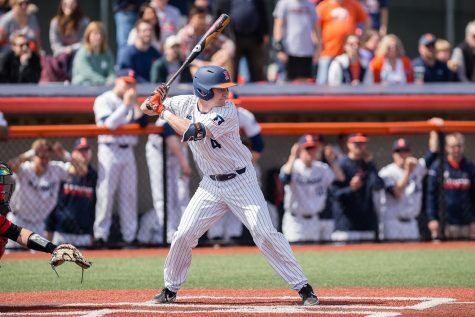 Illinois’ Pat McInerney hits a single to left field during game one of the team's doubleheader against Penn State at Illini Field on Saturday, March 26. 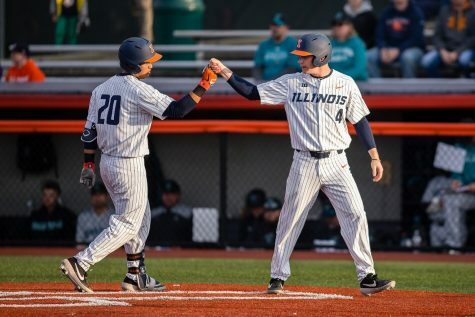 Illinois third baseman Trent Hammond already had two hits Tuesday evening, as well as a chance to tie up the game with his third. Instead, the senior struck out swinging with runners on second and third base to end the game, a 2-0 loss to Bradley at home. 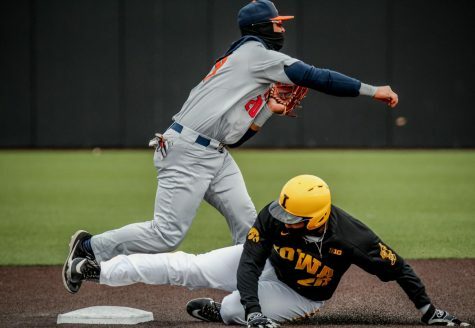 The Illini’s inability to break through with timely hitting was evident, going 0-for-13 with runners on base in their second shutout of the season. 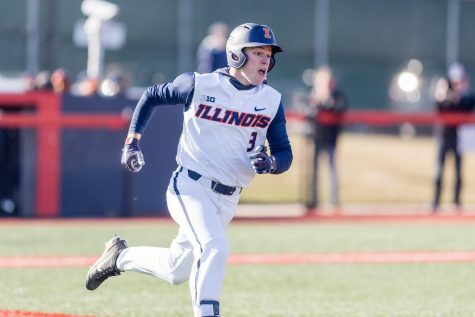 Illinois (6-16) left runners on base in every inning except the fourth, leaving nine on base in total. Bradley (10-12) was no more impressive than Illinois on offense. The Braves mustered five hits, four of them coming from the top-third of their lineup. Bradley opened the scoring in the top of the first inning. 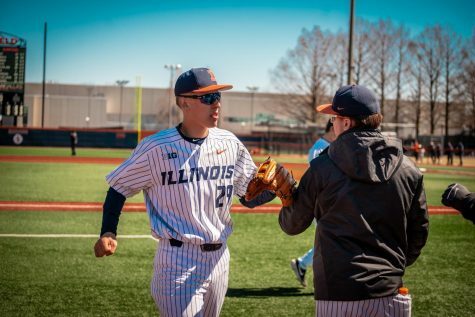 Illinois freshman starting pitcher Cyrillo Watson walked left fielder Spencer Gaa, who stole second base and advanced to third on a wild pitch. First baseman Luke Mangieri drove him in on a sacrifice fly to left field. Watson was credited the loss after he allowed one run on four hits in five innings, while striking out one and not allowing a walk. 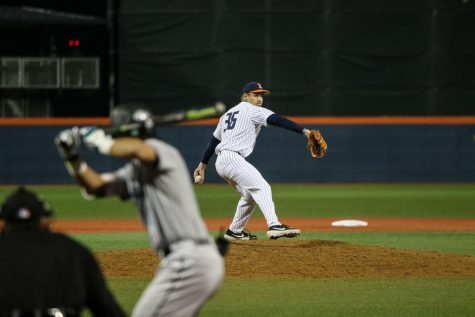 Illinois’ bullpen threw four innings, allowing one hit and one unearned run. 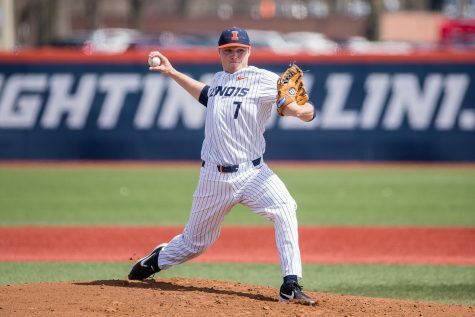 All five of Illinois’ pitchers against Bradley are classified as underclassmen. “I thought we made some steps forward with some young guys,” Hartleb said. The pitching performance was an improvement from the 17-6 loss to Michigan State on Sunday. 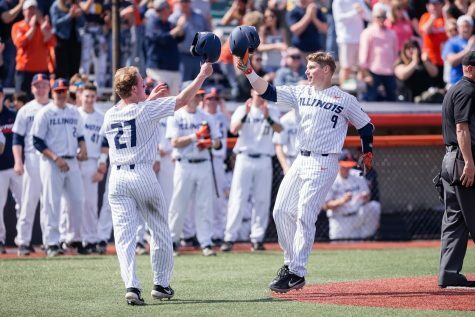 The Illini allowed a 2017 Division I-high eight home runs to the Spartans compared to zero against the Braves. 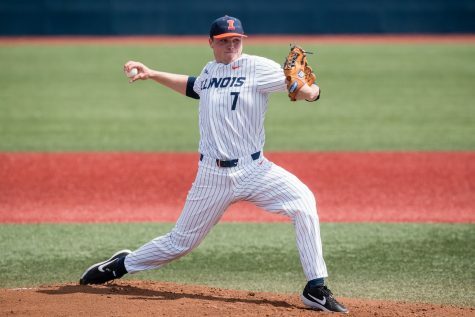 Hartleb said Illinois’ pitchers threw more quality pitches Tuesday. Sophomore Jack Yalowitz missed his second-consecutive game after running into the outfield wall last Friday versus Michigan State and undergoing concussion protocol. Freshman Michael Massey led off for the second-straight game in the absence of the left fielder. 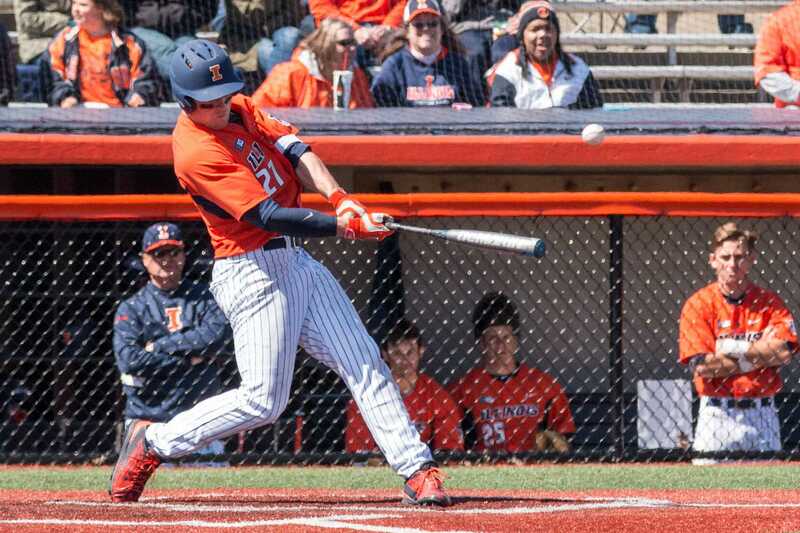 Doran Turchin and Hammond each had a pair of singles for the Illini. Right fielder Pat McInerney, who leads the Big Ten with eight home runs, added a double. 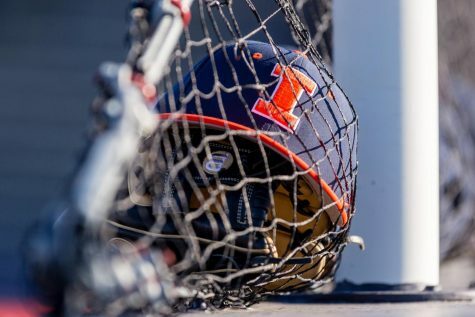 Illinois concludes its 12-game homestand with a three-game series against Indiana State this weekend. The Illini are on a four-game losing streak and are 2-7 in the home stretch. Illinois will get another shot at Bradley on April 25 in Peoria.